The host and attendee can screen share by clicking the Share Screen icon. 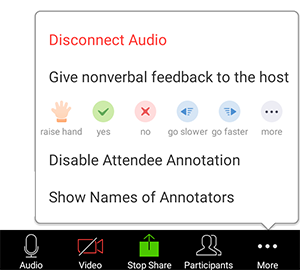 Click the Share Screen button located in your meeting controls. Select the screen you want to share. You can also choose an individual application that is already open on your computer, the desktop, a whiteboard, or an iPhone/iPad. Check Share Computer Sound: If you check this option, any sound played by your computer will be shared in the meeting. Check Optimize for full screen video clip: Check this if you will be sharing a video clip in full screen mode. Do not check this otherwise, as it may cause the shared screen to be blurry. 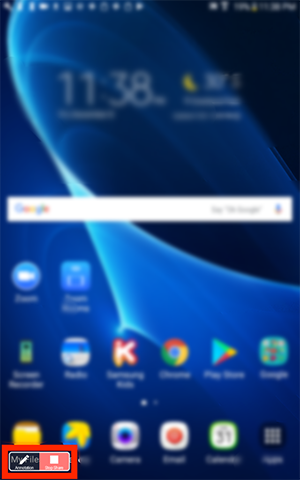 When you start sharing your screen, the meeting controls will move into a menu that you can drag around your screen. Start/Stop Video: Start or stop your in-meeting video. Participants/Manage Participants: View or manage the participants (if the host). New Share: Start a new screen share. You will be prompted to select which screen you want to share again. Pause Share: Pause your current shared screen. Annotate: Use screen share tools for drawing, adding text, etc. More: Hover over move for additional options. Chat: Open the chat window. Invite: Invite others to join the meeting. Record: Start recording locally or to the cloud. Live on Workplace by Facebook: Share your meeting or webinar on Workplace by Facebook. Learn more about live-streaming a webinar. Learn more about live-streaming a meeting. Optimize Share for Full-screen Video Clip: Start optimizing for a video clip in full screen mode. We do not recommend using this if you are not sharing a full screen video clip, as it make blur your screen share. End Meeting: Leave the meeting or end the meeting for all participants. Select Annotate to begin annotating on your shared screen. This will open the annotation menu. 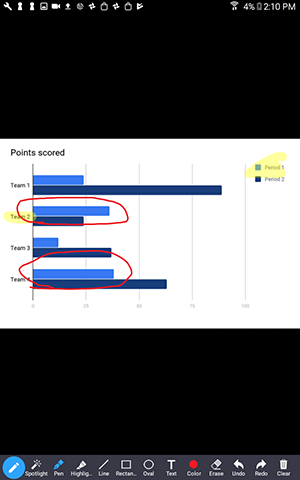 If you are using a dual monitor set-up, you can turn on the Use Dual Monitors feature to see the screen sharing on one monitor and participants on the second. Select the screen you want to share. Select the screen you want to share. You can also choose an individual application that is already open on your computer, the desktop, or a whiteboard. Record on this Computer: Start a local recording. Audio Settings: Open the audio settings in the client. Video Settings: Open the video options in the client. On Android, you can share content or your screen. Some of these options can be disabled in your account settings, under Integrations. Device audio will not be shared. For example, if you are playing a video on your device and share your screen, the video's audio will not be shared. Tap the type of content that you want to share. Photos: Share a photo from your file manager or photo apps (e.g. Google Photos). Depending on the apps installed on your Android device, you may see different share options. Documents: Select a locally stored PDF or image to share it. Box, Dropbox, Google Drive, Microsoft OneDrive, or Microsoft OneDrive for Business: Select a file to share from the selected file sharing service. You will need to grant Zoom access to your account. Only PDFs and images are supported. Website URL: Enter a URL to open a browser and share the website. 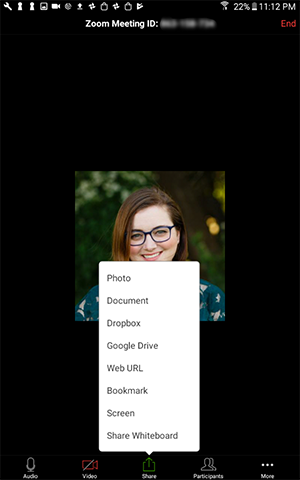 Bookmarks: Share bookmarks stored in the Zoom app. Share Whiteboard: Share a whiteboard you can annotate on. You can share your entire screen including any application on your Android device. Sharing your entire requires Android 5.0 or higher. The screen share will start and Zoom will continue to run in the background. You can now chose the app that you would like to share. At the bottom of your screen, tap Annotate to open the annotation tools or tap Stop Share to stop sharing and go back to meeting controls. Use the annotation tools to draw on your screen share or point out different items. When you are done annotating, tap the pen icon again to hide the annotation tools and return to the meeting controls. Screen - requires iOS 11 or later and Zoom version 4.1.18611.1228 or higher. Learn how to share your screen. Note that some of these options can be disabled in your Account settings, under Integrations. 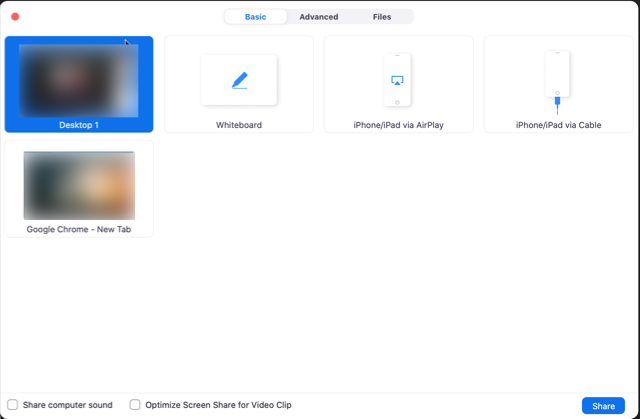 If you need to share your entire screen on an older version of Zoom, see sharing iOS Applications. For example, if you select Google Drive, this will bring up a series of documents that can be shared. 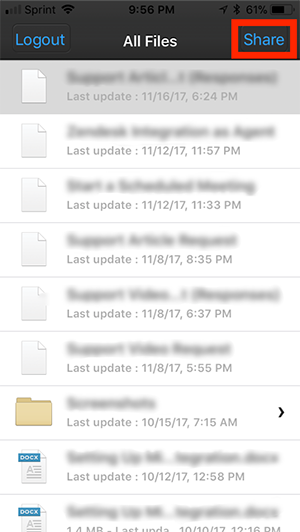 Select the document you want to share and then Share in the top right corner. The content is now shared into the meeting. Note: You cannot annotate when sharing your entire screen into the meeting via iOS device. If you need to annotate when sharing an entire iOS screen, see sharing iOS Applications.